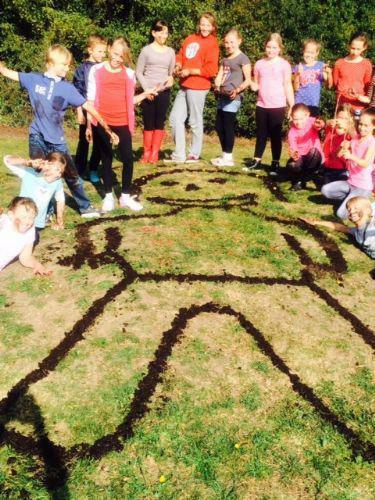 Forest Schools has developed from the Scandinavian education system and is about children and young people building self esteem and independence through exploring and experiencing the natural world. Forest Schools is a long term programme delivered by trained practitioners within a natural environment (not necessarily a Forest!). Each Forest School programme is tailored to meet the needs of individuals within that group and is continuously developed as the children/young people grow in confidence, skills and understanding. The ethos of Forest Schools allows learners the time and space to develop skills, interests and understanding through practical, hands- on experiences. 1.It is proven from research that learning which takes place in the outdoors is much more powerful and memorable as all the senses are involved. 2. Forest Schools develop children through a child led approach. 5.They learn to respect and appreciate nature. What will my child be doing? The Forest School routine varies, however it will include; preparing to go out by dressing in outdoor clothes such as waterproofs; travelling to the site; singing special songs and sharing stories. 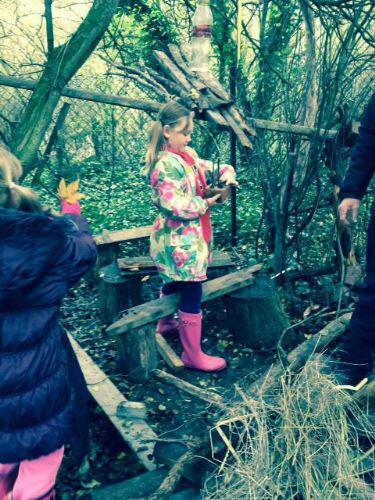 Our Forest School will run all year round and in all weathers (unless weather conditions are dangerous). · Using tools for a purpose – such as peeling bark from sticks with potato peelers to make toasting forks. Sessions are planned around the children's needs, and built upon each week..
Forest Schools is a high quality learning experience. The earlier sessions will concentrate on safety; establishing boundaries and routines. As the children develop in confidence and familiarity with the environment the sessions focus on the development and consolidation. Arrival. The group sit in a circle, deep breathe relax and sing our forest school song etc. Activity choice – the children choose either the recommended activity for the day or an activity from the borrow bag. Snack break. At an appropriate point during the session, we have a snack and drink. Reflection at the circle for conclusion. The journey back. Children return equipment and help to leave the site in the manner they found it before returning to school. • Health and fitness – Being active in an outdoor, natural environment. • Increased emotional wellbeing – There is research available supporting this. • Social development – Communicating, and negotiating with peers and adults to solve problems and share experiences. • Skills development – Developing fine and gross motor skills and coordination for real purposes. • Gaining knowledge and understanding – Multi–sensory, real-life learning. • Individualised learning – Careful observation allows adults to tailor support to children’s own interests and stage of development.